Nothing in the House: Sweetie Pie: A Valentine's Day Party! Sweetie Pie: A Valentine's Day Party! We're having a party! Much like last year's Tart of Gold Party (how could we duplicate a name like that?) with Tarts by Tarts, Nothing-in-the-House will be teaming up with Treasury Vintage and a new addition-- Elizabeth Graeber to bring you Sweetie Pie, a Valentine's Day Party. It's going down on Wednesday, February 13th from 5-8pm at Treasury, located at 1843 14th St. NW in DC. 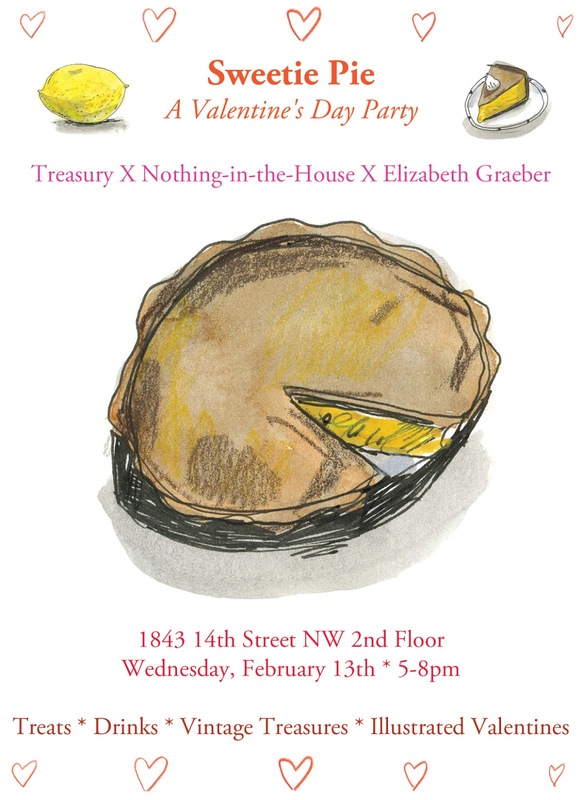 There will be treats by Nothing-in-the-House, vintage treasures from Treasury, illustrated valentines by Elizabeth, complimentary drinks, and love in the air. And perhaps you want some sweets for your sweet? At the party, you can also pick-up your made-to-order Valentine's Day pie which we're offering for the occasion! Selections include Orange-Hazelnut, Shaker Lemon, and Chocolate Coconut (there's a savory option too!) and are $32 each. You can get all the details and place your order here. Perhaps love is in the pear...tarte tatin? Labels: Nothing-in-the-House Baking Co., Washington D.C.